There are multiple elements that make up a switchboard. Included in the list of elements are a frame, buses, overcurrent protective devices, service metering, and outer covers. The frame of the switchboard houses and supports the other components. The standard Siemens switchboard frame is 90 inches high and 32 or 38 inches wide. An optional height of 70 inches with widths of 32, 38, or 46 inches is also available. Siemens switchboards have a depth measurement ranging from 20 to 58 inches. A bus is a conductor or set of conductors that serves as a common connection for two or more circuits. NEC® article 408.3 states that bus bars shall be located so as to be free from physical damage and shall be held firmly in place. Siemens Rear Connected (RCS) switchboards feature individually mounted branch and feeder devices. Because of this method of mounting, access to outgoing cable terminations must be from the rear of the switchboard. Bus bar extensions from the feeder devices are run back to the rear of the unit for easy access. The front and rear of all sections align. Both indoor (NEMA 1) or outdoor (NEMA 3R) construction are available. RCS switchboards accommodate systems up to 6000 amperes, 600 volts maximum in any three-phase three-wire or three-phase four-wire configuration. The main bus can be specified for 600 to 6000 ampere rating. RCS Switchboards use WL insulated case (UL 489) or LV power (UL 1 066) circuit breakers with drawout mountings and continuous current ratings from 400 to 5000 A for main and branch devices. 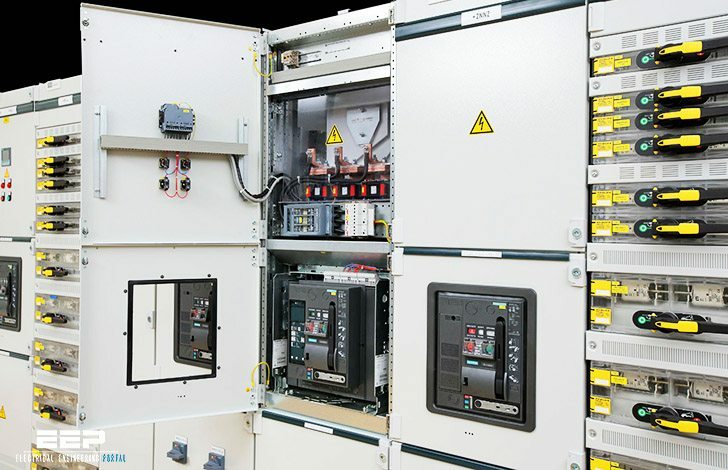 The modular design of Siemens Integrated Power System (IPS) switchboard allows the customer to integrate electrical distribution equipment, power monitoring, and environmental controls that typically mount in multiple enclosures into one switchboard line-up. Customers have the freedom to configure an arrangement that best fits their individual needs. Optional factory installed interconnection wiring is available to further reduce installation time. IPS switchboards are built to UL 891 and NEMA PB-2 standards. IPS sections have a standard height of 90 inches. Optional 70 inch high sections are available. The minimum depth of IPS sections is 1 3.75 inches. Optional depths of 20, 28, and 38 inches are available and these optional depths may be required depending upon the components installed. IPS switchboards consist of one service section and one or more distribution sections that are cable connected. However, IPS switchboards are also available with through bus and pull sections. IPS switchboards accommodate systems up to 4000 amps, 600 VAC maximum in 1 -phase, 3-wire; 3-phase, 3-wire; and 3-phase, 4 -wire configurations. Testing Procedure and the reference readings for impedance, insulation, RCD and earth fault.